Reverse mortgages, at least the government-backed variety that about 90 percent of borrowers choose, have undergone significant changes in recent months. Here’s what anyone considering a Home Equity Conversion Mortgage (HECM) should know about reverse mortgage pros and cons. Reverse mortgages are a form of home equity loan – you exchange some of your home’s equity for cash, and the lender records a lien against your property. What’s different about reverse mortgages is that you don’t have to make payments to the lender, and the loan doesn’t need to be repaid at all until you no longer occupy the residence. While this may sound like the perfect loan, it’s wise to gain a further understanding of how they work and consider the reverse mortgage pros and cons. Offered by local, state, and non-profit agencies, this reverse mortgage is used to fund a single purpose, such as paying for home repairs or property taxes. Backed by the U.S. Department of Housing and Urban Development (HUD), an HECM is the most popular type of reverse mortgage. There are no restrictions on how you can use the money and there are several payment options that offer flexibility with how you tap into your home's equity. Available through private lenders, these reverse mortgages allow borrowers to receive large sums of cash, but are only available to those whose homes appraise at high values. LendingTree Pro Tip. If your partner is a co-borrower, both you and your partner will be able to keep living in the house even after one of you passes. Probably the number one reason people use a reverse mortgage is so they can pay their bills and maintain their lifestyle. If you aren’t struggling with money, this loan provides you with an opportunity to mark things off your bucket list. With the payments you receive, you can travel, golf, or do just about anything you’ve been dreaming about. If adult children have been helping out with the bills, funds may be used to cover those monthly expenses, freeing your children from the financial obligation of supporting their parents. If you have an existing mortgage or line-of-credit, you may use the proceeds to pay these off. A reverse mortgage may be used to delay the use of a 401k or to delay the collection of social security benefits. This extends the life of your savings and, in the case of the latter, may increase the benefits you receive in later years. Bad credit and low-income do not prevent loan approval. However, the lender is required to conduct a financial assessment and if you don’t pass, it will withhold some of the loan’s proceeds for home-related expenses like property taxes and insurance. If the loan is repaid in full, any remaining equity is returned to you or your estate. Your heirs can buy back the home for just 95% of its value if they choose to do so. If your loan balance grows larger than the property value, government mortgage insurance covers the difference—not you and not your family. You can't take out an HECM before completing reverse mortgage counseling with a HUD-approved counselor. This is to make sure you understand the product, know how to shop for the best one, and are comfortable with your decision. If you choose the “tenure” option, which provides income for as long as you live in your house, you’ll keep receiving payments, even if your loan balance exceeds your home’s value. You don’t outlive your loan. Reverse mortgage payouts can be structured to meet a variety of needs. If you want money in reserve for emergencies, a line of credit is a relatively inexpensive option, and it will grow over time. A lump sum is good for paying off debt or financing a large purchase. You can also choose monthly payments to supplement your income. Or, choose a combination of these methods. You can even take out a reverse mortgage to purchase a home. Personal finance and real estate professionals estimate the cost of selling a house at ten percent of its value while buying knocks off another two-to-four percent. So, selling a $400,000 home and buying a $200,000 home could subtract $44,000 from your profits, leaving less than $160,000 in the bank. With a reverse loan, you might be able to borrow $200,000 against your house, you won’t have to move, and you’ll stay in your $400,000 property. LendingTree Pro Tip: Be wary of investment strategies that ask you to borrow against your home to invest in stocks, bonds, or other financial products. All investments can lose value, and this puts your home at risk. Since you don’t make monthly payments, reverse mortgage balances grow larger over time. That can eat up home equity more quickly than you realize. Also, the mortgage insurance is calculated based on the home’s value. So, if you just want a small loan, it can be prohibitive. If you see the proceeds as a windfall and spend without a plan, you could end up short of cash, with no home equity to fall back on. That’s why the government limits how much you can cash out in your first year – it’s trying to protect some of that equity for future needs. This can cause problems in some families because heirs don’t like the idea of possibly losing “their” family home. They can render you ineligible for certain government benefits unless you structure the payout carefully. Lump sum distributions can create problems for those getting Medicaid or Supplemental Security Income (SSI). If you have to leave your home earlier than you planned, you’ll have paid all the reverse mortgage fees upfront without receiving the benefits you expected. Although you’re receiving payments from your home, you’ll still be responsible for paying your homeowners insurance and taxes and you’ll need to continue home maintenance. Changes to reverse mortgage laws eliminated some of the cons that used to be associated with these loans. Non-borrowing spouses who are not on the property title (as long as they’re married before taking out the reverse loan) can no longer be evicted if the borrowing spouse dies or enters a nursing facility. New financial assessments and impounding largely eliminate the risk of foreclosure. And mortgage insurance premiums for most borrowers have come down. However, one less positive change is that, in many cases, homeowners can borrow against a lower portion of their property value than they could in the past. Lenders and mortgage brokers may charge up to $6,000 for originating the HECM reverse mortgage loan. Homes under $400,000 will have an origination fee between $2,500 and $6,000. Homes more than $400,000 will have the maximum origination fee of $6,000. This is a one-time, nonrefundable charge that ranges between 0.5% – 2.5% of the appraised value of the home, depending on how much you borrow. 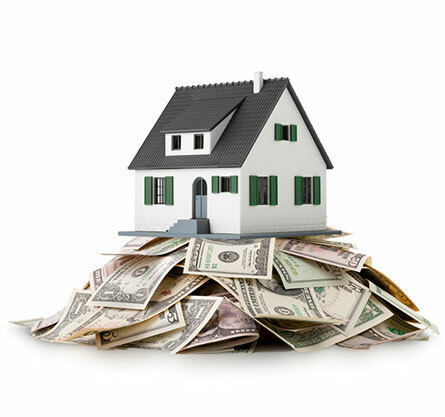 Also called real estate settlement costs, these costs include the appraisal, title insurance, and inspection fees. A reverse mortgage counselor will educate you on alternatives and provide you with information about your costs and options. The cost is usually about $125, (paid to the agency, not the lender). However, financial aid may be available to low-income individuals. LendingTree Pro Tip. The upfront costs associated with a reverse mortgage have no limit, so get quotes from multiple lenders and compare fees. Costs over time include interest and mortgage insurance premiums. Interest may be fixed or adjustable. Over the last few years, fixed interest rates for reverse mortgages have hovered below 5%, while the adjustable rate has steadily increased. Taking out a loan with a lower interest rate is to your benefit, so be sure to compare quotes from several lenders. Keep in mind that mortgage insurance will add an additional 1.25% on top of the interest rate. LendingTree Pro Tip. Borrow less than 60% of your initial principal limit to qualify for a lower mortgage insurance rate. Is there an alternative way to achieve your financial goal? Do you have heirs you plan to leave your home to? Do you plan to live in your home for a long time? Can you continue to pay your property taxes and homeowner’s insurance? LendingTree Pro Tip. Considering a reverse mortgage, but not sure if it’s right for you? Find a HUD-approved housing counselor who can explain reverse mortgage pros and cons in detail.